Members of the school’s Junior and Senior classes each spent an hour in session with representatives from businesses interested in employing Philip Barbour’s graduates. Participating businesses included Alderson Broaddus University, Arch Coal, BC Bank, the Barbour County Health Association, the Broaddus Hospital Total Therapy Center, Cvechko Insurance, Davis Health System, Delta Cooling Towers, Freedom Bank, Mullens & Mullens Attorneys, New Vision Renewable Energy, Quality Hydraulics, the Taylor County Prosecuting Attorney, The Thrasher Group, and the Youth Leadership Association. Hunter Mullens of Mullens & Mullens served as the Master of Ceremonies for the afternoon and chaired the Career Fair Committee which included Pat Jones from Delta Cooling Towers, Joe Kaiser of Kaiser’s Coffee and Candy, Eric Ruf of the county Health Association, and Dr. Don Smith, Chamber Director. 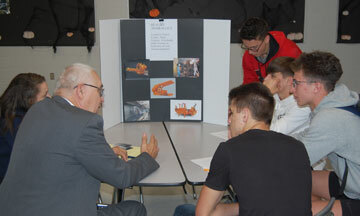 The Career Fair was held in the Commons Room of the school. The photos above were taken during the program.